The ultimate in sharpening steel technology with the "World's First" interrupted surface, diamond coated, oval sharpening steel. 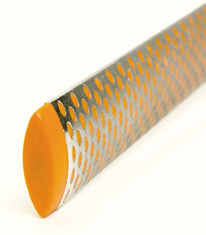 Smith's 10" Diamond Sharpening Steel features a unique sharpening surface with a over-lapping oval hole design, which is coated with multiple layers of micron-sized monocrystalline diamonds. This innovation helps speed the sharpening process by collecting and holding the metal filings which ordinarily build up during the sharpening process. 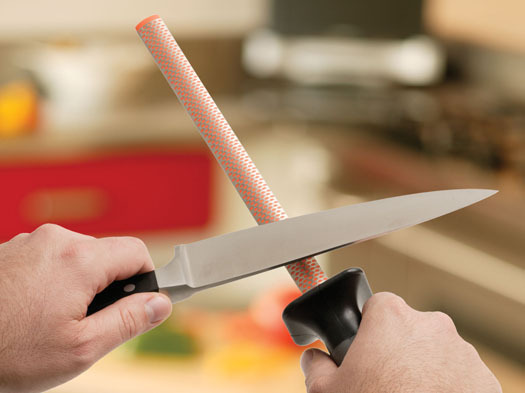 It comes with a soft grip rubber handle and oversized hand guard for comfort and safety. Unlike conventional steels, which only re-align your cutting edge, the Smith's 10" Diamond Sharpening Steel hones and re-aligns your edge at the same time.